DOVER, NEW JERSEY, SEPTEMBER 13, 2018 - Today, Casio G-SHOCK unveils an all-new, limited edition men’s watch collection in celebration of the brand’s 35th anniversary. 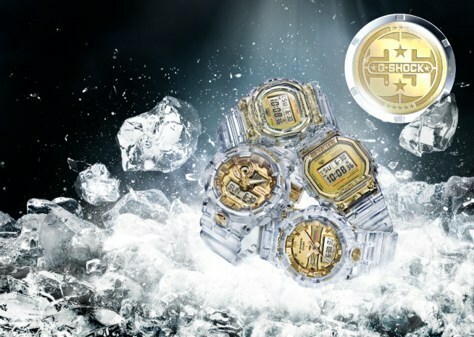 Featuring four of G-SHOCK’s most popular silhouettes, including the DW5000, DW5700, GA700 and GA800, the collection boasts a unique translucent band and bezel as well as gold IP accents on the dial, buckle, band keeper and case back, which also display the G-SHOCK 35th anniversary logo. Nodding to G-SHOCK’s brand heritage and original case design from the 1980’s, both the DW5035E and DW5735E feature screw-lock case backs and a stainless steel strap keeper in case sizes of 42.8mm and 45.4mm. In addition, the DW5035E boasts G-SHOCK’s iconic brick pattern on the display – providing an additional vintage element to the timepiece. Separately, the GA735E and GA835E models feature a front button design for easy access to a super LED light and a unique hand retract function – in case sizes of 53.4 and 48.6mm. The GA735E also boasts a five year battery and 3D bold hands, while the GA835 includes a 3-hand combination and 120 LAP memory. The DW5035E-7 and DW5735E-7 will retail for $220 each, while the GA735E-7A and GA835-7A will retail for $190 each. All four models will be available for purchase beginning in October at select G-SHOCK retailers including Macy’s, the G-SHOCK Soho Store, and gshock.com.